I have read a lot of critical reviews for this book, some that say this is unrealistic. Actually, at the end of the audio book is (I believe it's an interview with the author) an excerpt about the sources she used for reference and what parts she embellished for the sake of her story. Who is anyone to say what is real or unrealistic about the human mind, when it is capable of so much. 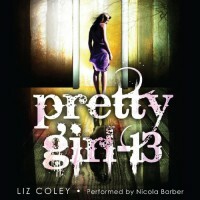 My opinion is that this story is raw, gritty, disturbing, well written, and Nicola Barber (the narrator for MP3 Audio version) deserves some serious props for the many voices she performs. I don't think I would recommend this for the younger side of YA, because of the subject matter but, 16 and older should be ok for them.